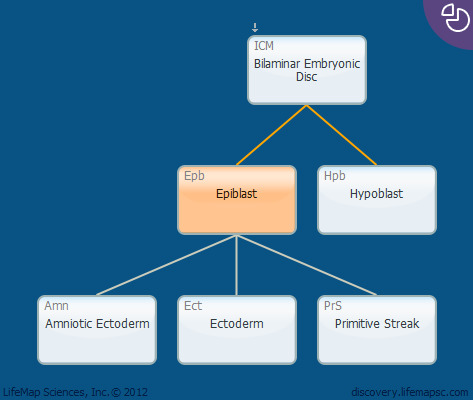 The epiblast is derived from the inner cell mass and lies above the hypoblast. The epiblast gives rise to the three primary germ layers (ectoderm, definitive endoderm, and mesoderm) and to the extraembryonic mesoderm of the visceral yolk sac, the allantois, and the amnion. The cells of the three primary germ layers contain the progenitor cells of all the tissues of the fetus and of a few extraembryonic structures. The epiblast cells (appearing on day 8 of human embryonic development) make up a columnar epithelium with dense microvilli on the apical surface. During gastrulation, the epiblast cells undergo epithelial-to-mesenchymal transition and delaminate to become the loose mesenchyme of the primitive streak. The epiblast is present in postimplantation mouse embryos between E5.5-E7.5.